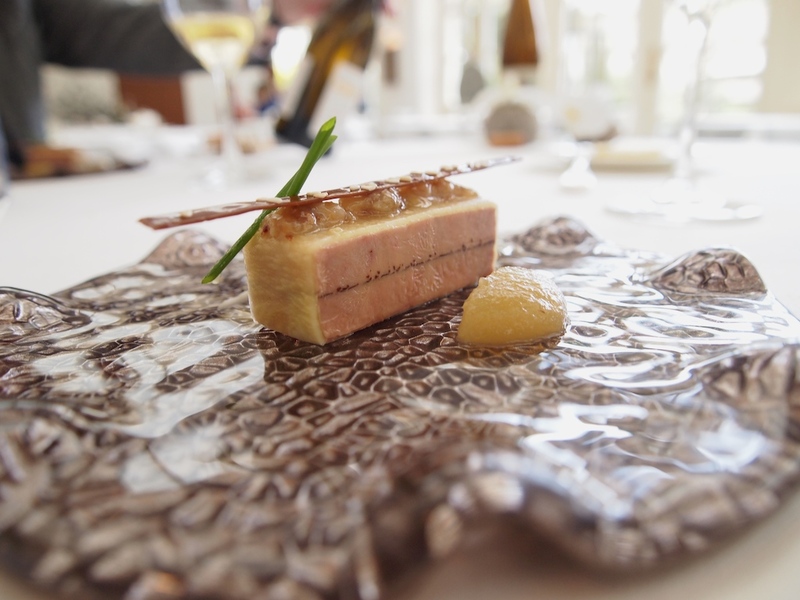 Manoir Restaurant Inter Scaldes ("Inter Scaldes") is currently the longest-running restaurant in the Netherlands to hold two Michelin stars. 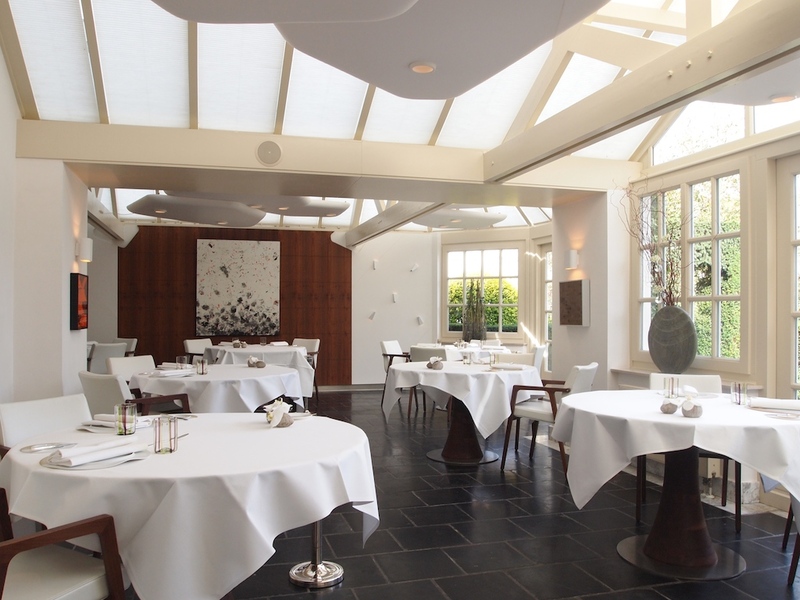 The second star was awarded in 1984, when the restaurant was under the reign of the previous owners, Maartje (chef) and Kees (maître d'hôtel) Boudeling, making Maartje the first Dutch female chef to be awarded two Michelin stars. Since 2001 the restaurant has been run by husband-and-wife team Jannis (chef) and Claudia (maitre d'hôtel) Brevet, a couple that have turned Inter Scaldes in one of the most celebrated destination restaurants in the country. As I explained in my 2012 review, the name Inter Scaldes refers to its location between the Oosterschelde and the Westerschelde estuaries. The name is in Latin and translates into "Between the Scheldts". Manoir Restaurant Inter Scaldes is a Relais & Chateaux property and the "Manoir" is a separate building which houses 12 luxury rooms and suites. In 2013 the restaurant's interior was redesigned. 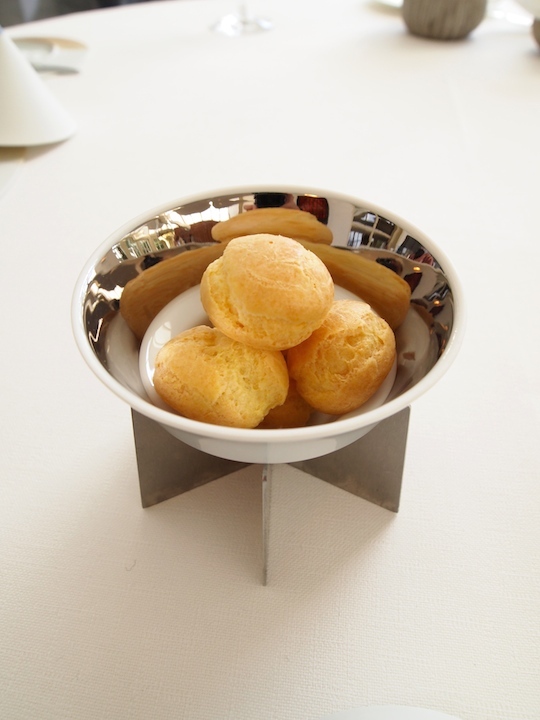 To start there was a selection of four canapés, including a bowl with delicious Parmesan profiterolles. The other three were (clockwise from top): a warm 'bitterbal' with a thin, evenly coated breadcrumb casing and a satiny and powdery soft egg yolk filling, lightly seasoned with basil - watermelon injected with lime and filled with finely chopped cucumber, served on top of a creamy and smooth pea puree, covered with a thin layer of clear tomato jelly and topped with dots of concentrated tomato puree - an (organic) duck foie gras bonbon, coated with a mixture of almond and apricot and served with a Savora mustard crisp. An excellent and carefully chosen selection of canapés, prepared with great skill and finesse, the egg yolk bitterbal being exceptionally amazing. 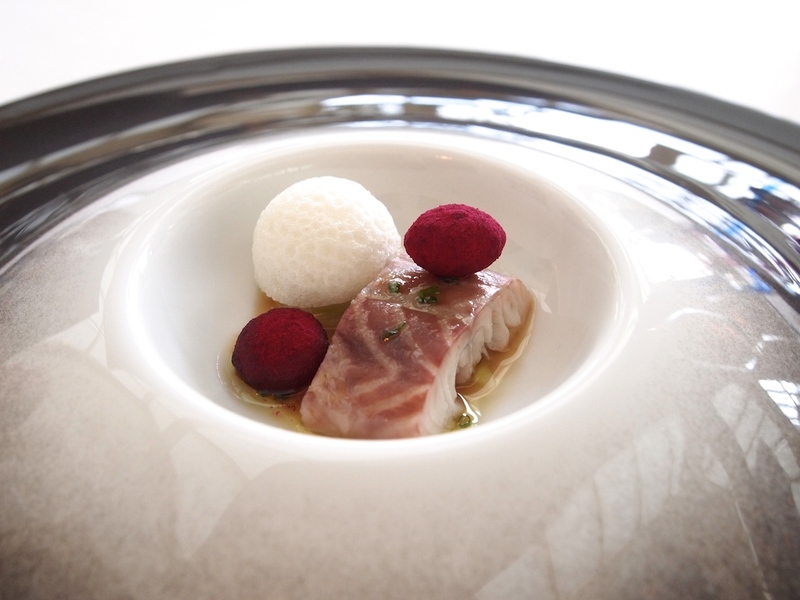 Next to arrive was an amuse bouche of lightly smoked 'Oosterschelde' eel, served with an apple molasses ('appelstroop') dressing, strips of cucumber, a verjus foam/sponge, and two perfectly made mini potato soufflés, coated with beetroot powder. A wonderful amuse bouche, the eel being moist and meaty, and the dressing was elegantly sweet with a lovely hint of acidity. This was soon followed by a second amuse bouche of a refined duck liver créme flavoured with Peking duck spices, topped with a light popcorn foam and accompanied by fig compote. A marriage of great, precise flavours, the fig compote delivering an elegant sweetness. First course of the tasting menu was thinly sliced octopus, served with a light lavender vinaigrette, and topped with dots of green apple puree, strips of fresh green apple, and sliced karkalla (a type of sea vegetable). Underneath the octopus was a smooth onion crème, delicately flavoured with yuzu, and an algae puree was dotted around. 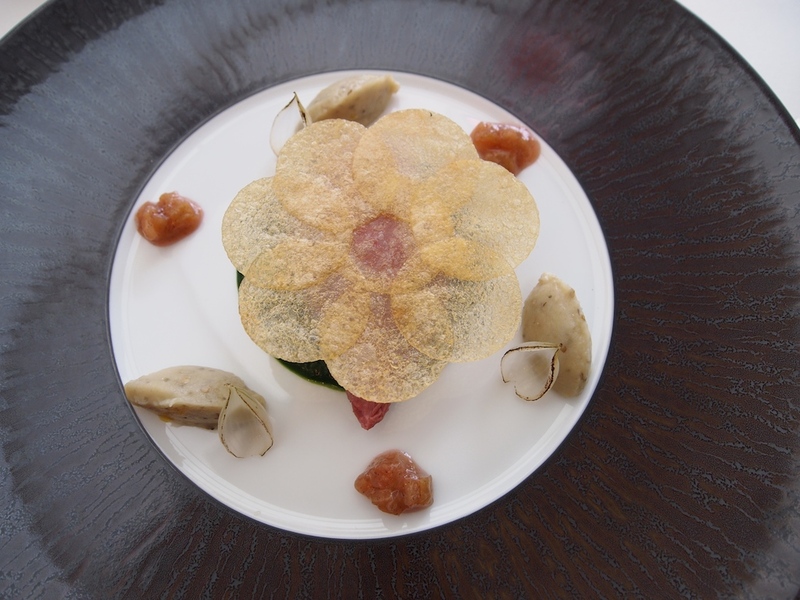 A visually striking dish with exquisite, balanced flavours and great textures. 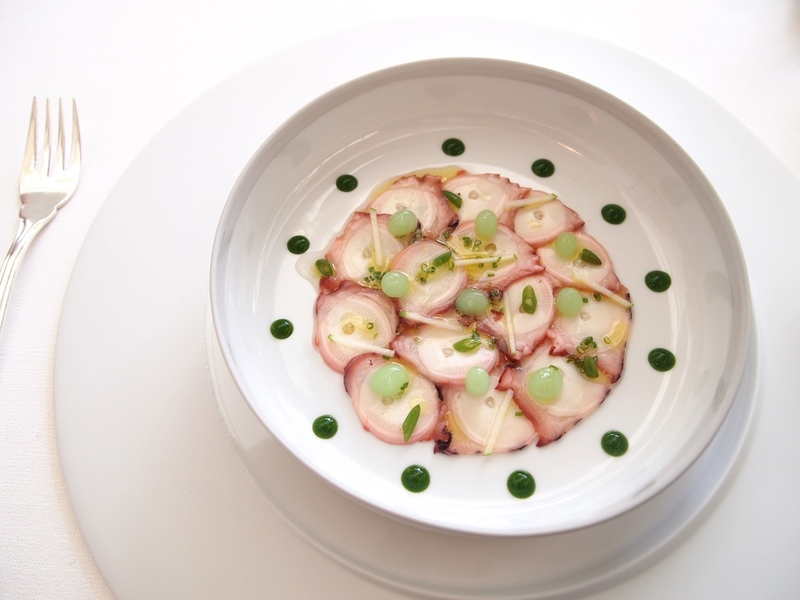 Very flavoursome and meltingly tender octopus that combined wonderfully with the mildly floral lavender vinaigrette and the delicious onion crème; the yuzu having been used with great success and subtlety. 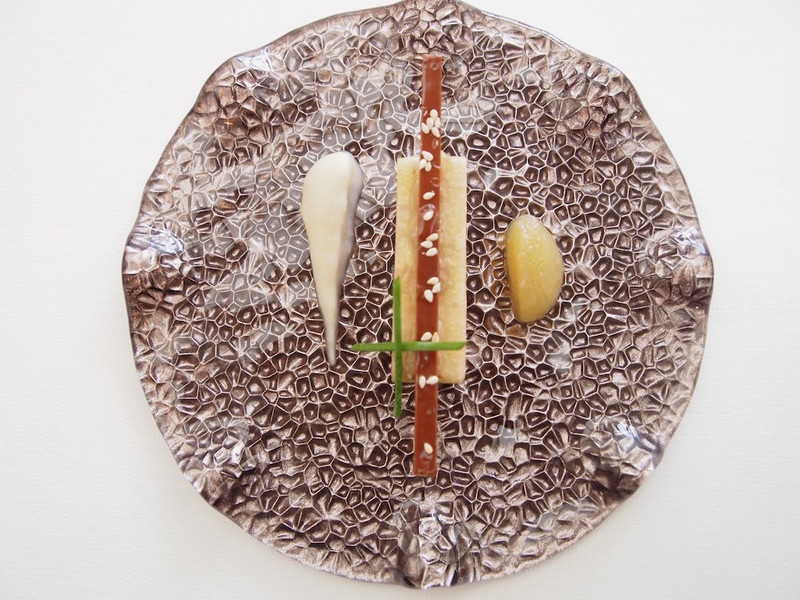 The onion flavours were creamy, sweet and aromatic, but the yuzu balanced the intensity, creating a certain lightness. Clever use of algae too, giving the dish a nice marine umami touch. 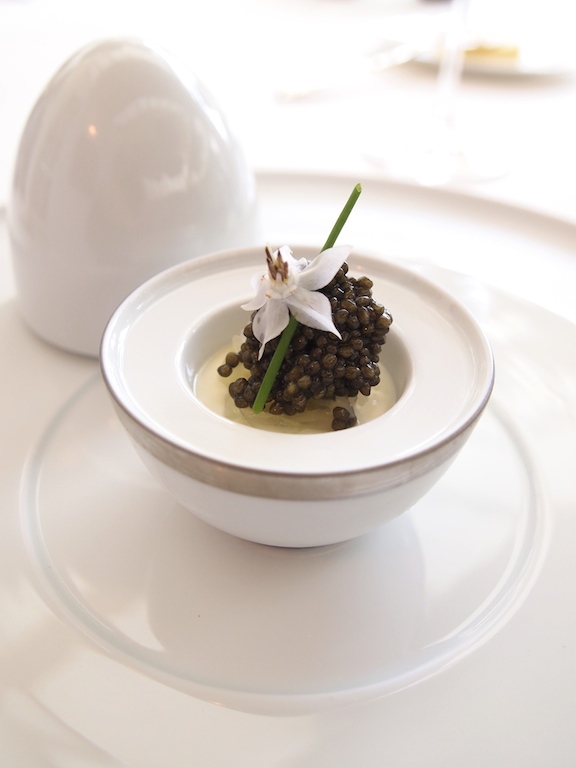 Second course was an egg-shaped cup filled with a creamy sturgeon brandade, covered with some thinly sliced grapes and appropriately topped with a dollop of Dutch Anna Royale caviar. An incredible elegant dish served at just the right, cool, temperature, and consequently the brandade wasn't too rich, resulting in a terrific balance between richness and freshness. 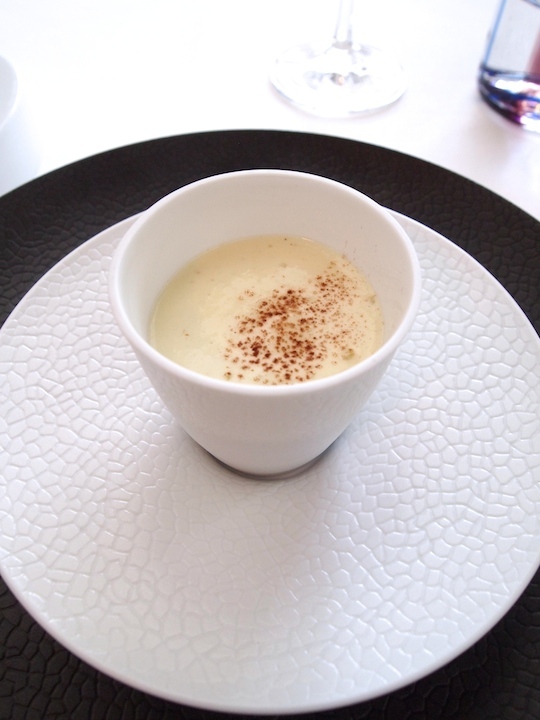 The brandade was very lightly flavoured with truffle, creating a lovely subtle truffle aroma. Next up was a slice of (organic) duck foie gras with a thin layer of chocolate sandwiched in between, wrapped with a layer of fresh, sweet pineapple, and topped with a nut, raisin and vendange tardive compote and a sesame crisp. Also on the plate was a Jersusalem artichoke puree and an apple and passionfruit compote. A saffron and sesame brioche was served on the side. A beautifully presented dish with a great interplay of flavours. The delicate sweetness and light vegetal notes of the Jerusalem artichokes matched the foie gras wonderfully, and the apple and passionfruit compote delivered a lovely, mildly sweet, freshness. These two attractive flavour combinations made this dish very digestable and a joy to eat. Fourth course was plaice, glazed with a ponzu sauce (in this case flavoured with daidai), topped with a brunoise of parsnip, accompanied by a Parmesan cheese jus plus foam and some Brussels sprout leaves. The plaice was well-cooked and had a wonderfully moist texture. Loved the Parmesan jus, which had a lovely richness to it, added a nice saltiness to the dish and complemented the mild sweetness of the plaice and the parsnip perfectly. The flavours of the daidai ponzu glaze, however, were indistinct. 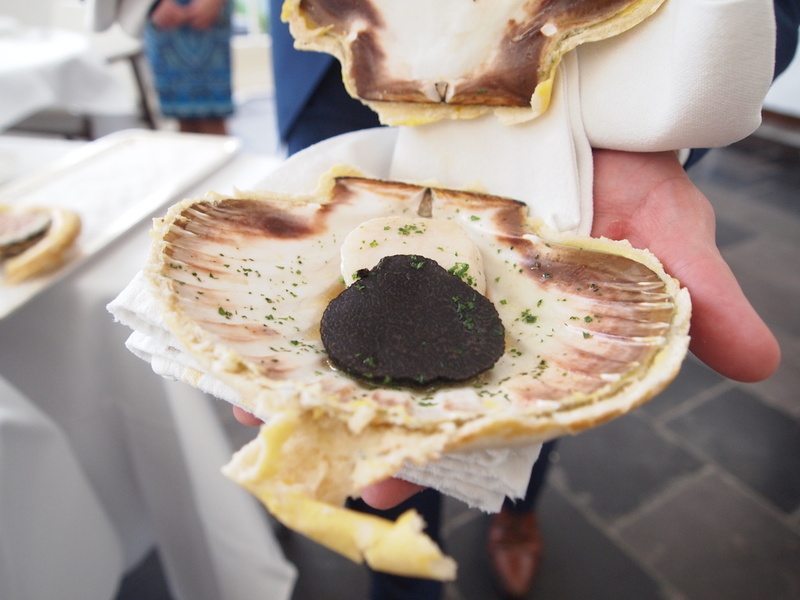 On to the fifth course, which was scallop and a thick slice of black truffle, cooked together in the shell, which was securely sealed with salted dough to lock in all the flavours and aromas. 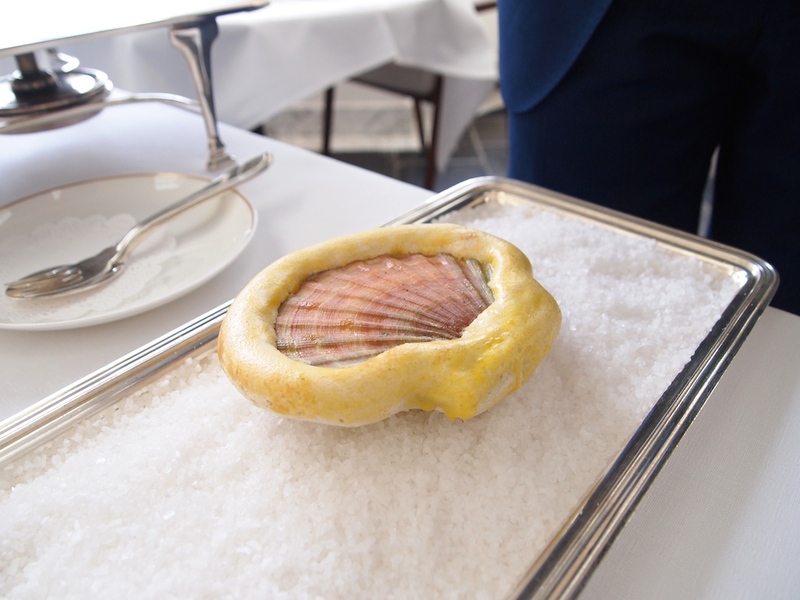 When the shell was opened tableside, it revealed a shiny and plump scallop, juicy and sweet. 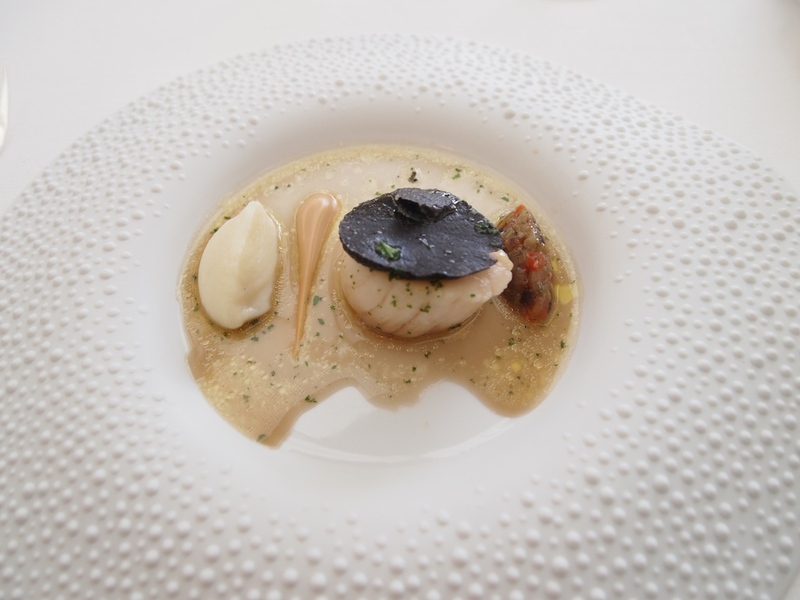 The scallop was succesfully paired with a cauliflower puree, a concentrated almond puree, a quenelle of finely chopped, marinated vegetables, and the scallop's cooking juices that had been infused with black truffle during the cooking process. Great crunch and the touch of piquancy from the marinated vegetables, that created a nice flavour contrast. Sixth course was succulent pigeon breast, served with a parsley puree, tea-flavoured aubergine puree, lightly roasted onions, a raspberry and rhubarb compote, and a rich pigeon jus, elegantly flavoured with lime and ginger. 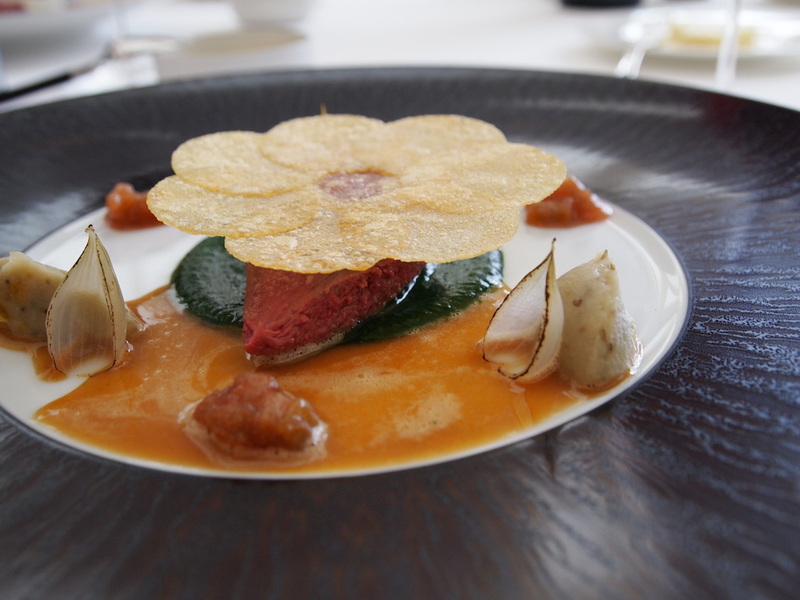 A gorgeous, buttery potato mash was served on the side and the pigeon breast was covered with a beautifully made wafer-thin potato crisp 'flower'. 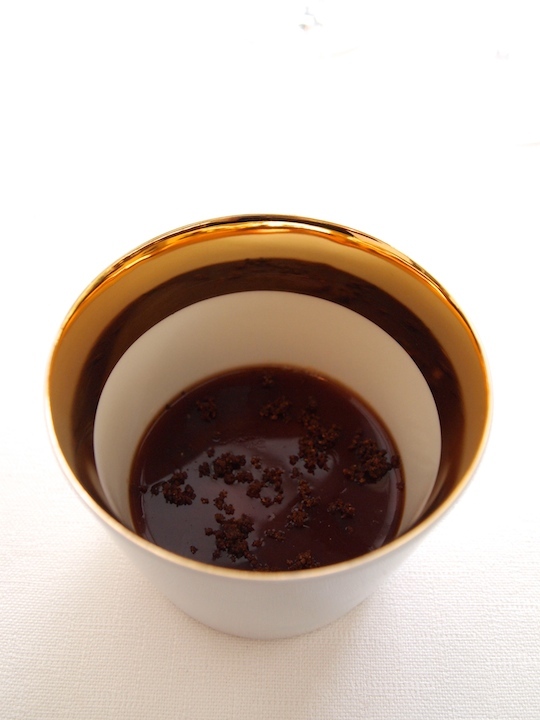 Both the aubergine puree and pigeon jus were judiciously seasoned, the former having lovely light tea notes in the aftertaste and the lime and ginger in the jus adding just the right amount of freshness. Loved the freshness and purity of the parsley puree, that balanced the richness in the dish perfectly. Immaculate cooking on all levels. The meal continued with a delightful pre-dessert of Buddha's hand mascarpone, covered with a layer of 'Bambu coffee' jelly made from chicory roots, the latter delivering lovely coffee-like bitters. 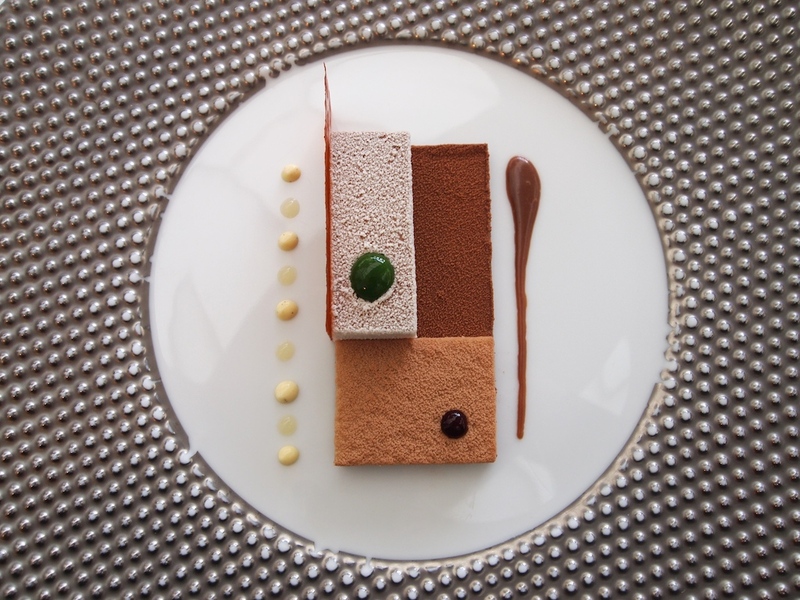 Eighth and final course was a chocolate dessert comprised of three compartments: banana and Bourbon vanilla - white chocolate and cardamom - chocolate and mint, accompanied by a thin tomato crisp, smoked caramel and three coulis: algae, blackberry-eucalyptus and semolina. 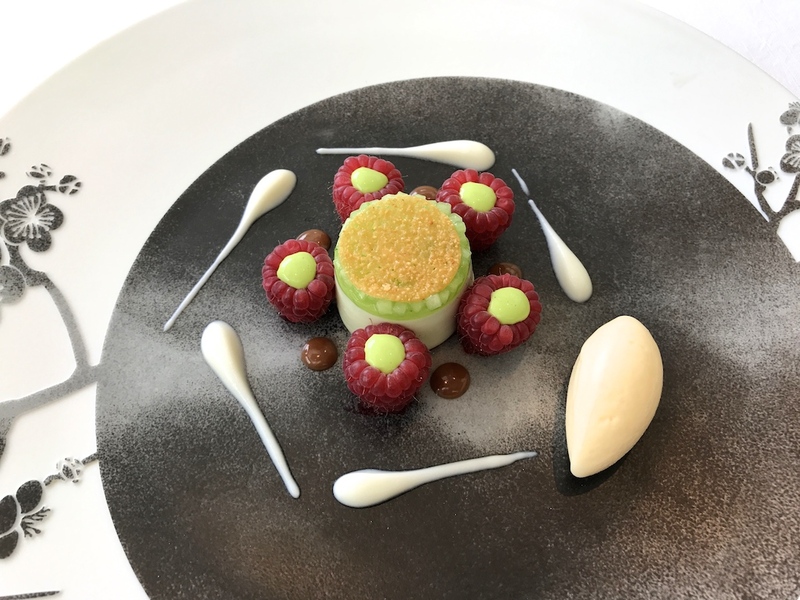 A spectacular dessert with wonderful soft textures and all the individual flavours came through beautifully, but were also great when combined. 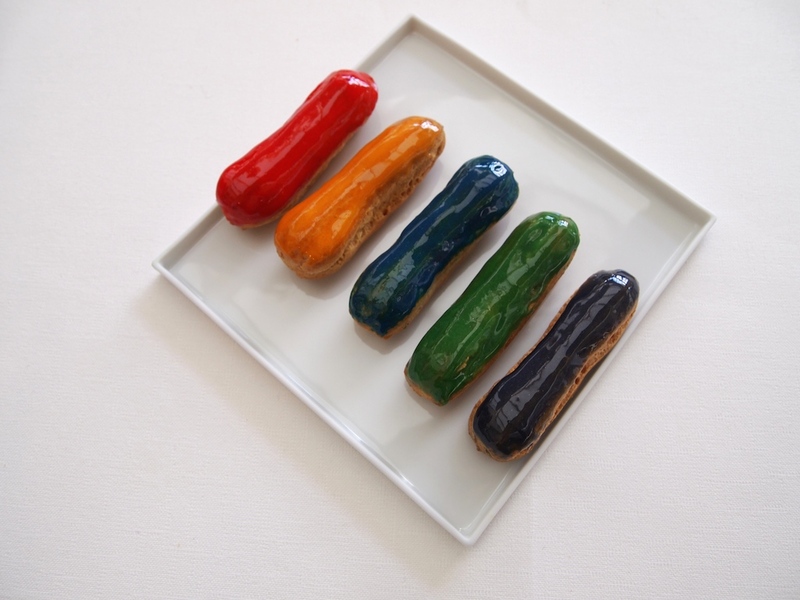 We were also served a colourful éclair collection: lemon verbena (red), banana (orange), blackberry (blue), pistachio (green), and blueberry-violet (purple) - gorgeous! It had been two years since my last visit to Inter Scaldes and the differences between my two meals here were subtle but striking. There are many constants too. Jannis Brevet was and is a superb craftsman - there is no doubt he is one of the finest chefs in the Netherlands. He sources the best ingredients available and his cooking is complex and classical, but also creative and clean. He creates dishes which display great finesse and precision, both in preparation and presentation, and he has done so for almost fifteen years here. The differences, you ask? 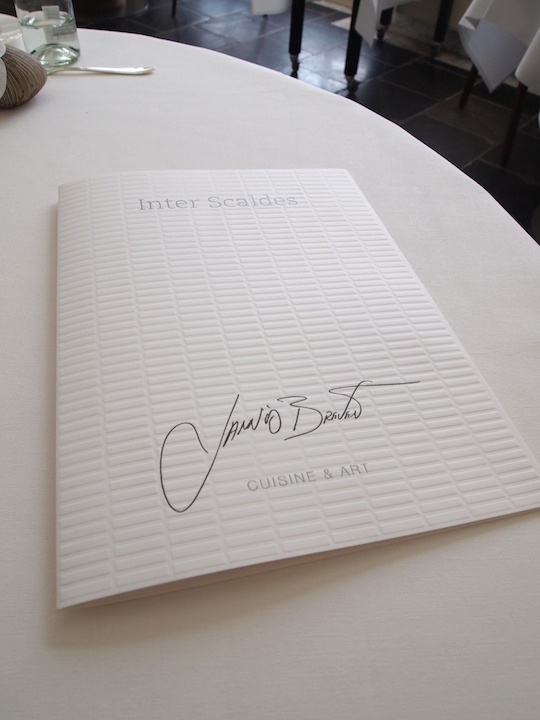 My meal at Inter Scaldes in 2012 was clearly outstanding but there were some minor issues too - there was the odd imprecision, the odd rough edge, the occasional lack of definition. Obviously we are splitting hairs here. This time however (and this is a crucial difference) excellence was delivered consistently throughout the meal with almost mathematical precision; any creases had been ironed out. 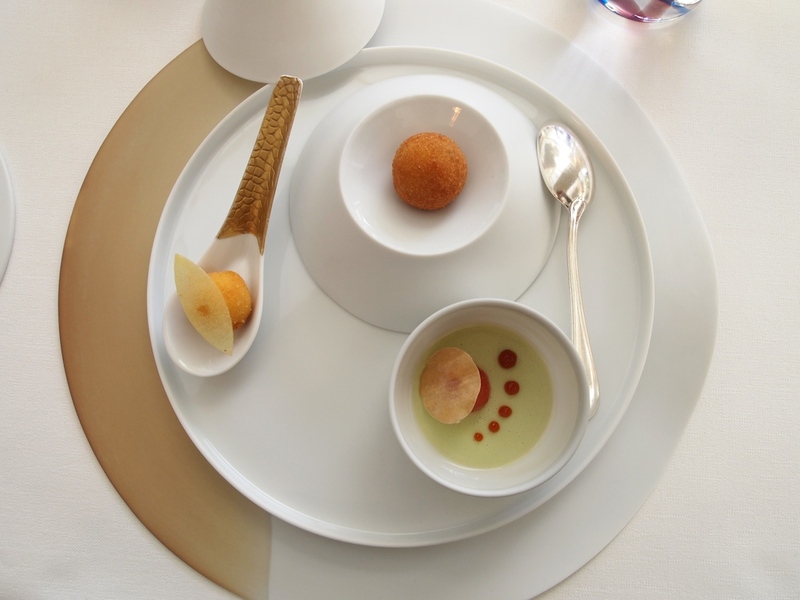 Even by the most rigorous and inflexible of standards, this meal was extraordinary. I have amended my score accordingly. If this meal is anything to go by, Claudia and Jannis Brevet, with their unceasing efforts, have elevated Inter Scaldes to the top tier of restaurants.